bl.uk > Online Gallery Home	> Online exhibitions	> Asia, Pacific and Africa Collections	> Chándá Market. Photograph of Chándá Market. 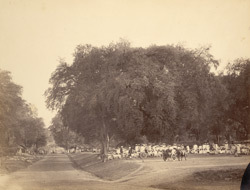 Taken in the 1870s by Ritter, Molkenteller & Co., this print is from an album entitled 'Views in India and Bangladesh', part of the Temple Collection. Text accompanying the photograph reads, 'The Chándá market is held inside the City walls in the open air on a spot shaded by tamarind trees. These trees are of great beauty and under their shade lines for market stalls are laid out in regular order'.